"Q. What is the EM Drive propulsion system and what makes it so unique? A. An EM Drive uses electromagnetic waves (e.g., radar) to produce thrust, which is obviously something that is needed for a rocket engine. The drive consists of a truncated conical copper shell with a plastic (polyethylene) disc covering the narrow end of the truncated cone. An electromagnetic wave is induced inside the copper shell in the same manner as a microwave oven. The propulsion system is unique because the device uses no traditional fuels or propellants. Instead, in the simplest of terms, the electromagnetic waves bounce around inside the cone in a way that some say causes propulsion. In the NASA tests, a thrust of 1.2 millinewtons per kilowatt was reported for an EM Drive activated in a vacuum, which is a very, very small – but noticeable – movement. By not relying on traditional fuels, the EM Drive would make spacecrafts lighter, and eliminate the need for massive amounts of fuel currently required to launch a spacecraft to far-off destinations...."
Q. What's behind all the skepticism about the EM Drive, and what's your take on all of this? A. 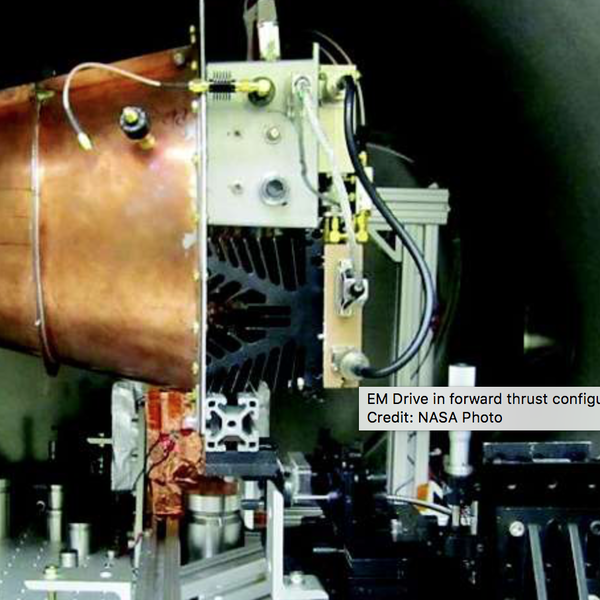 Although the EM Drive appeared to create thrust in these tests, there was no mass or particles of any kind expelled during the process. This is a violation of Newton's third law of motion, which says that for every action there is an equal and opposite reaction. Action and reaction is a direct result of the conservation of momentum. The violation of such a basic law as the conservation of momentum would invalidate much of the basis for all of physics as we know it. Hence, many scientists and engineers feel the thrust measurements reported for the EM Drive are due to experimental error. Adding to this is the fact that those who believe the results are valid do not yet have an experimentally or a theoretically plausible proven physical explanation. I personally believe that there is a mundane explanation for the results. For example, electric currents are heating components within the Drive that expand during the experiments, causing motion that would appear as a force. It is very difficult to remove such effects, although the authors of the journal article tried to remove not only these thermal effects but also many other possible sources for experimental errors. It is extremely difficult to know for sure that all of the possible sources for errors have been removed. The only sure method is to have a hypothesis (or theory) that can be tested independently...."
First 100 Days of Deal-Makers LBJ & DJT. @LizPeek @FiscalTimes.